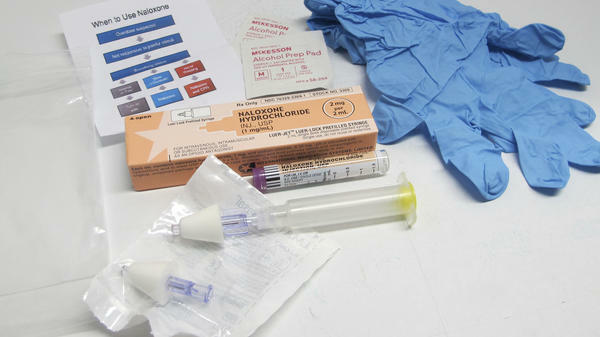 The contents of a drug overdose rescue kit at a May 13, 2015, training session in Buffalo, N.Y., on how to administer naloxone, which reverses the effects of heroin and prescription painkillers. 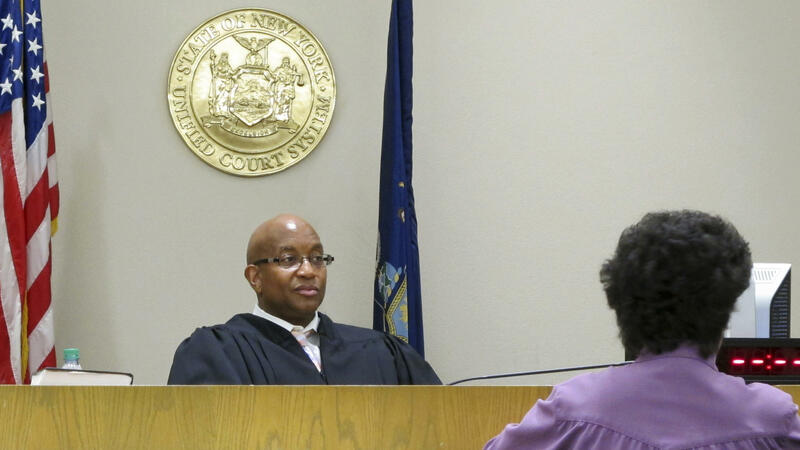 In this June 20 photo, City Court Judge Craig Hannah presides at Opiate Crisis Intervention Court in Buffalo, N.Y. The first such program in the country puts users under faster, stricter supervision than ordinary drug courts, all with the goal of keeping them alive. It's 10 feet of space where Stein began to walk back 10 years of crippling intravenous heroin addiction and its sordid aftermath: burned bridges with family and friends, and a stream of lies and criminality to support her drug habit. Today is Stein's first day back before Hannah after a month of inpatient treatment in Buffalo's new opioid intervention court. Stein shows the judge a folder full of awards and certificates earned during her recovery. "Oh, you've also been a positive peer mentor. Wow. You really did your thing down there. Congratulations," Hannah says, looking Stein in the eyes. "How many days clean?" "Keep up the good work, that's awesome." Federal, county and city court officials are looking hard at Buffalo, N.Y.'s new opioid crisis intervention court as one potential model solution to the epidemic of heroin and opioid overdoses that continue to devastate families and communities across America, taxing local governments, first responders and the nation's criminal justice system. "Right now we're trying to save them. I'm trying to save their life," says Judge Hannah, who presides over this first-in-the-nation experiment that aims to fast-track addicts into wraparound treatment before adjudicating their criminal cases. "I want them to have another sunset, another time with their family, to see another Christmas." Buffalo's opiate court is, essentially, an iteration of the traditional drug court where an addicted nonviolent offender is channeled into recovery as an alternative to jail and a chance at a reduced sentence. When Stein first appeared before Judge Hannah, she was dressed in an orange city jail jumpsuit and shackled in handcuffs and chains. She was pounds thinner with dark circles under her eyes and heroin track marks on her arms. Today she looks alert and upbeat, dressed in jeans and a casual top. And now she gets to walk right up to Judge Hannah's bench, to cross those 10 feet and talk face-to-face. "I feel like me again and it's awesome," Stein replies. "You know you have to see me every day after treatment right, unless you're in group?" "OK, yeah I know," she says. In that moment, Hannah seems more like a friend than the black-robed judge who could order Stein to jail if she runs — again — from treatment. The first go-around Stein bolted from her detox bed and the serious heroin possession charges hanging over her. She wanted to get high. After Stein was rearrested in August, Judge Hannah gave her another chance to get clean and a second chance to maybe get those criminal charges reduced. "Put the clock on hold"
The necessity for a special opiate court underscores the crippling severity of the nation's drug overdose and addiction crisis, which killed some 64,000 Americans from February 2016 to February 2017, according to preliminary data from the CDC. The big difference here is speed: If the defendant wants help to kick heroin or opioids, Judge Hannah and his team quickly hit "pause" on the criminal charges to get the person into treatment fast, often within hours or the next morning. "Right from arraignment, we put the clock on hold. We turn off the court reporter, everything's off the record, and we're talking about getting you help," Hannah says. "And once we get you help and get you stabilized, we put the criminal case back on the calendar." Usually that's on the calendar of the city's long-established drug court with a chance to get the criminal charges reduced or even dismissed. But often in traditional drug courts it can take weeks or longer to get a defendant into a detox or an inpatient treatment center. And with opioid addicts, that delay can prove fatal, particularly with heroin and fentanyl. "We couldn't wait three or four weeks until we got the individuals into a treatment program or plan," says John Flynn, the district attorney for Erie County, N.Y., which includes Buffalo. "Because they didn't get it right away, they were going back out in the streets, shooting up fentanyl, and dying." Erie County is on track this year to record the highest opiate overdose death total in its history. "We average just over one overdose death per day," says Mary St. Mary with the county's Department of Health. The court's program includes random, regular drug testing and a nightly curfew. Defendants have to check in at 8 p.m. and "ping" their location to a court staffer. Participants are also channeled into one-on-one and group counseling among other support services. So Judge Hannah knows fast if someone's using again or didn't show up for counseling or curfew. "Addicts are very good at lying, at manipulating and having them finally take accountability" is vital, says Brooke Crouse, the opioid court liaison for Horizon Health Services, a main provider of the court's addiction treatment services. "We have someone who finished the program in June and he still calls in every night at 8 just for that accountability, to stay focused," Crouse says. And after a 30-day inpatient detox, participants enter 30 days of outpatient treatment. And every weekday at 11 a.m. during that treatment, every recovering addict has to check in with Hannah. To sit in court, wait for his or her name to be called, and walk up close to his bench for a one-on-one talk. Any slip-up is usually addressed within hours at the next morning's one-on-one. "If they don't go to group, it's addressed at 11. If they skip out on curfew, it's addressed at 11," Crouse says. If, however, an opiate court participant — Hannah prefers that term to defendant — fails to show up, he issues a warrant for their arrest. A stern talking-to by Judge Hannah or his compassion or the possibility of an arrest warrant is not always enough. "It's easier once those cuffs come off to run out the door and go get high instead of going to get treatment to get better," Crouse says. No one gets indefinitely kicked out of the program for minor infractions, and Hannah will let you restart your treatment multiple times. And given the reality of relapse during recovery, many participants are on their second time through the court. It's 28-year-old Amanda Davis' second time attempting the program. She landed here after getting arrested for drug possession and petty larceny. She was stealing store items including energy drinks and selling them on the street to feed her heroin habit. "I started on pills — Percocet, oxy, morphine — anything I could get my hands on. And moved to heroin," Davis says. A Colorado native, Davis says she moved to Buffalo to try to get away from addiction. She could not. "I was using every single day, as much as I could." She says her life completely fell apart during her eight years of drug abuse, which also saw several family members die because of opioid and alcohol abuse. After washing out of the program the first time, she asked to come back. She now believes she's finally on track to stay clean. "Judge Hannah has been the most helpful, useful person I've had in my life in the last eight years," Davis says. "If I wasn't here I think I'd be dead. I've lost three siblings to this." At a recent morning session, Hannah wasn't tolerating any more excuses and spin from a middle-aged man who earlier in the week failed his drug test. "I just need you to be honest with me so I can help you," he tells the man, who didn't want his name used. "Right now you are outside the circle of trust," Hannah tells him. "You're gonna have to work hard to get back inside the circle. OK?" The man says he's heading off to group therapy and then a job fair at a local church. "OK, your test is negative today, so keep up the good work," Hannah tells him. "Looks like you're starting to get back on track." "I thank God for this at the end of the day," the man says. "For you, the court. Something good's going to come out of this, I know it." Judge Hannah says the close-in talking, closing that gap between the podium and his bench, is not for show. "If you don't put eyes on them and have that face-to-face continual contact, and also to reassure them that we're actually working and caring for them, I think a lot of people get lost and they fall off in their recovery," he says. The public defender's office here is an enthusiastic backer of the opioid court. Flynn, the Erie County DA, says local law enforcement are supportive as well. It's dumb, Flynn says, to keep arresting, jailing and prosecuting repeat offenders who are, first and foremost, opioid addicts in need of help. "If an individual doesn't get the help they need, they are going to be a perpetual criminal. They're going to be committing petty larcenies every day," Flynn says. "They're going to be engaging in prostitution, perhaps, in drug possession, perhaps drug sales to further their habit. They are a revolving door within our criminal justice system. And the police don't want that." Buffalo's program, in which criminal addicts are immediately assessed and referred for treatment within hours, is generating attention. "This fast-tracking (in Buffalo) is really unique and generating a lot of interest out there," says Christopher Deutsch with the National Association of Drug Court Professionals. "That's a big piece of it," Bureau of Justice Assistance policy adviser Gregory Torain says of the city's rapid-response model. "That's very new." The opiate court was created in May of this year with the help of a $300,000 grant from the Justice Department. It's too soon to draw big conclusions. But Torain says the Bureau of Justice Assistance is "encouraged by what we've seen so far, what they've been able to do." He says the bureau will continue to assess and support the court's efforts. So far the numbers show that Buffalo may be on to something: Of the roughly 140 participants, only four have washed out of the program. "I'm very happy with that number," says Jeffrey Smith, project director of New York's 8th Judicial District and a prime mover behind creation of the court. "And zero deaths (in the program). I'm ecstatic about that number." Richard Baum, acting director of the office of National Drug Control Policy, colloquially called the drug czar, recently visited the opioid court to examine how the federal goverment might help replicate the idea in other heroin-damaged cities across the country. County and city court officials from all over the country are also calling and emailing about the program, court officials say. Health professionals agree heroin and opioid addicts are particularly vulnerable to overdose during the detox phase and the period right after. And the courts "really need to be aware of that and all the stakeholders — judges, prosecutors, law enforcement — all need to be communicating with each other about that," Deutsch says, adding that "Buffalo really is out in front in adapting that model." The interest in Buffalo's experiment comes as a committee created by the National Governors Association is studying how states could expand drug treatment within the criminal justice system. "People are going to slip up"
Part of the opioid court's success, so far, might be the fact that Judge Hannah knows firsthand about addiction. For a time in his youth, Hannah says, he struggled with cocaine dependency. "I know that you can have every intention of trying to stay clean, but at 2 o'clock in the morning when that demon calls, and no one's around and no one's looking, a lot of people are going to slip up," he says. "You can't lock up an addiction, because the addiction is still there." In the court's hallway, recovering addict Caitlyn Stein says if Judge Hannah hadn't given her a second chance she'd likely be in prison or dead. "Having someone who understands and doesn't judge me for it, knows that, like, no one is exempt from this disease. If it'd been another judge, I'm not sure I'd be here today clean." She always wanted to get clean, she says, since starting to shoot up heroin at 16. "Been in jail a couple times but only stayed clean for a short period of time. This has completely changed everything for me," Stein says. "I can finally live again. It feels good to laugh, like belly laugh, and I cry, but I'm OK with crying now. Where before I was just a zombie, is the best way to put it. Use to live and live to use. I don't ever want to go back to that." Then, just a few days later, a few days into her outpatient treatment, Stein failed to show up for her daily check-in with Judge Hannah. And the next time Stein sees Hannah, she is likely to be in handcuffs and behind that wooden podium about 10 feet from his bench. And in the court's eyes, anyway, it will be back to Day 1 of her recovery. Court officials say she's been in touch via phone and always promises to turn herself in the next day. So far, she has not. Judge Hannah tells me he's pulling for Stein and all of those cycling through his opioid court experiment. "I always tell everyone, we play by Vegas rules: What happens here stays here. You tell me what's happening, we're not going to charge you with new charges. We're going to give you the help that you need, because we know that this is an addiction. "But we can't help you," Hannah adds, "until you're honest with yourself." America's opioid crisis continues to devastate families and communities across this country. It is also taking a toll on first responders and the criminal justice system. One city decided to take a new approach. Buffalo, N.Y., has created the nation's first opioid intervention court to try to fast-track treatment for addicts who commit crimes. Now some are looking to Buffalo's experiment as a possible model across the country. 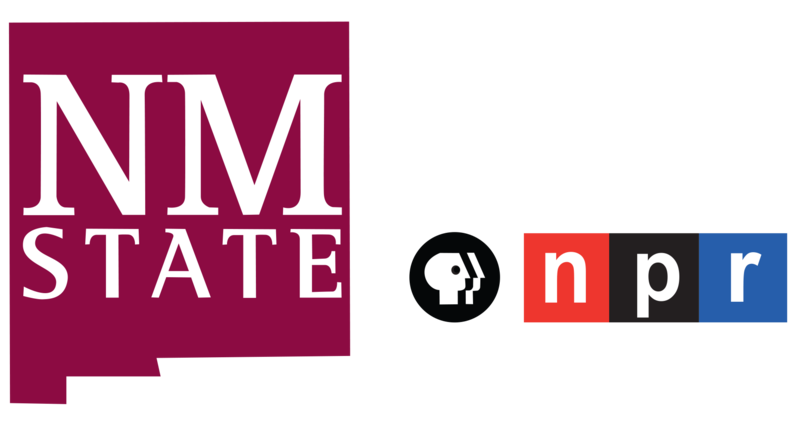 NPR's Eric Westervelt paid a visit. UNIDENTIFIED COURT CLERK: Caitlyn Stein - C.R. 6786617 - scheduled for a report. CRAIG HANNAH: This is your first day back. Good to see you. CAITLYN STEIN: Good to see you. HANNAH: We just have to do that before and after picture. WESTERVELT: ...Ten feet where Stein began to walk back 10 years of crippling heroin addiction, burned bridges with family and friends and waves of lies and thievery to support her drug habit. Today is her first day back before Hannah after a month of inpatient treatment in Buffalo's new opioid intervention court. She shows the judge a folder full of certificates earned during her recovery. HANNAH: Oh, you've also been a positive peer mentor. HANNAH: How many days clean is this? HANNAH: Keep up the good work. That's awesome. WESTERVELT: This experimental opioid court is an iteration of the traditional drug court, where an addicted, usually nonviolent offender is channeled into recovery as an alternative to jail and a chance at a reduced sentence. But it can often take weeks or longer to get a defendant into a detox or inpatient treatment center. And with opioid addicts, that delay can prove fatal. But here, if the defendant wants to get clean, Judge Hannah immediately hits pause on the criminal charges to get the person into treatment as fast as possible. HANNAH: Right from arraignment, we put the clock on hold. We turn off the court reporter. Everything's off the record, and we're talking about getting you help. And once we get you help and get you stabilized, we put the criminal case back on the calendar. WESTERVELT: But back on the calendar of the city's long-established drug court, with a chance to get the criminal charges reduced or even dismissed. When Caitlyn Stein first appeared before Judge Hannah, she was in handcuffs, chains and an orange jumpsuit - rail thin, dark circles under her eyes, heroin track marks on her arms. Today she looks alert, dressed in jeans and a casual top. And she now gets to approach Judge Hannah's bench, to walk those 10 feet to talk to him face to face. HANNAH: How do you feel? STEIN: I feel awesome. I feel like me again. HANNAH: You know you have to see me every day after you go to treatment? WESTERVELT: In that moment, Hannah seems more like a friend than the black-robed judge who could order Stein or other opioid court defendants to jail if they bolt from treatment. The program includes random, regular drug testing. So Hannah knows fast if someone's using again. And participants are channeled into one-on-one and group counseling and other support services. There's also a nightly curfew. Defendants have to check in at 8 p.m. and ping their location to a court staffer. And after 30 days of inpatient detox, participants enter a month of outpatient treatment. And every weekday at 11 a.m. during that treatment, every recovering addict has to check in with Judge Hannah to sit in court, look him in the eyes and just talk. HANNAH: I just need you to be honest with me so I can help you. WESTERVELT: A middle-aged man is called up for his daily check-in. He says he's heading off to group therapy and then a job fair. HANNAH: You test is negative, so keep up the good work. HANNAH: And it looks like you're getting back on track. UNIDENTIFIED MAN: Yes. I thank God for this at the end of the day - for you, the courts. HANNAH: If you don't put eyes on them and have that face-to-face continual contact and also to reassure them that we're actually working and caring for them, I think a lot of people get lost, and they fall off in their recovery. WESTERVELT: The necessity for an opioid intervention court underscores the severity of the nation's overdose and addiction crisis. According to preliminary CDC numbers, overall drug overdoses killed some 64,000 Americans from February 2016 to February of this year. It's estimated 6 in 10 of those deaths was caused by opioids. Here in Buffalo - Erie County, N.Y., is averaging an overdose death every day. WESTERVELT: John Flynn is Erie County's district attorney. FLYNN: ...Because if they didn't get it right away, they were going back out on the streets, shooting up fentanyl and dying. WESTERVELT: D.A. Flynn says he and other law enforcers here enthusiastically support the court. It's just dumb, he says, to keep arresting and jailing repeat offenders who are, first and foremost, addicts in need of help. FLYNN: If an individual doesn't get the help they need, they are going to be a perpetual criminal. They're going to be committing petty larcenies every day. They are a revolving door within our criminal justice system, and the police don't want that. WESTERVELT: The court is less than 6 months old, so it's too soon to draw any big conclusions. But so far, the numbers show that Buffalo may be on to something. Of the roughly 140 participants, only four have washed out so far. And no one in the program has died. Part of the opioid court's success so far might be the fact that Judge Hannah knows firsthand about addiction. In his youth, Hannah says, he struggled with cocaine. He's able to tell defendants, I've been there. HANNAH: I know that you can have every intention on trying to stay clean. But when that demon calls at 2 o'clock in the morning and no one else is around, everyone slips up from time to time. You can't lock up an addiction because the addiction is still there. WESTERVELT: In the court's hallway, recovering addict and criminal defendant Caitlyn Stein tells me if Judge Hannah hadn't given her a second chance, she'd likely be in prison or dead. STEIN: I've always wanted to be clean, but I've never gone to rehab. I've been in jail a couple of times, but it's only been clean for a period of time. So this has completely changed everything for me. WESTERVELT: You know, I was taken by your comment to the judge today, I feel like myself again. I mean, after 10 years, that must feel pretty good. STEIN: Yeah, yeah. It feels good to, like, laugh - like, belly laugh. And I cry. But it's OK. Like, I'm OK with crying now, where before I was just a zombie, I guess, is the best way to put it. And I don't ever want to go back to that. WESTERVELT: A few days into her outpatient treatment, a day after this interview, Stein failed to show up for her daily check-in with Judge Hannah. She bolted - again. A warrant's been issued for her arrest. And the next time Stein sees Hannah, she's likely to be in handcuffs, back behind that wooden podium 10 feet from his bench and, in the court's eyes, back to day one. Still, a court official told me, we'll be here for her when she wants to get sober. Eric Westervelt, NPR News, Buffalo. (SOUNDBITE OF SAXON SHORE'S "REPLACEMENT DRIVER") Transcript provided by NPR, Copyright NPR.